The Vestmannaeyar golf course is located on one of the Vestman Islands which are group of islands of the south coast of Iceland. The golf course is set in an old volcano, is a wonderful test of golf. 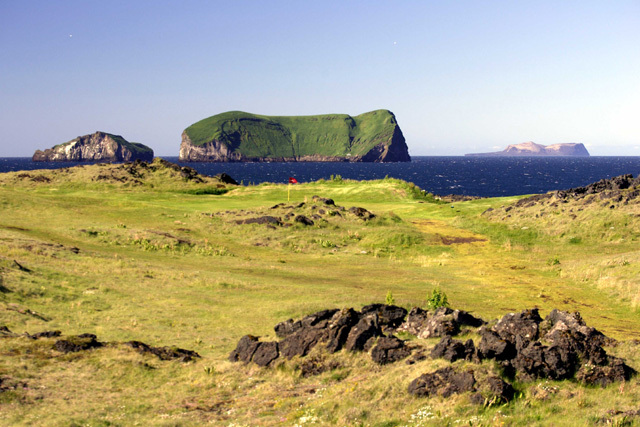 Teeing off against a backdrop of volcanic walls; changing wind directions on the same hole and playing across and over the sea are all features of golf in Vestmannaeyjar. The course has a reputation for having the best greens in the country. 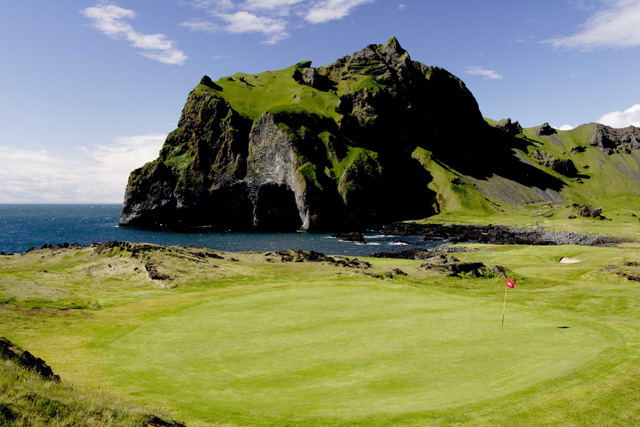 The Golf club of Vestmanneyjar is the third oldest in Iceland, founded in 1938 by 36 dedicated people. To begin with, the small valley Herjólfsdalur, was the settlement for the first 6 holes. Three of the original holes are still in use and those holes are the oldest golf holes in Iceland. Only year after a small clubhouse was finished in the east part of the valley and then enlarged in 1945. In 1962 the course boasted full 9 holes. National celebration in Herjólfsdalur forced the members to seek out new land south of the valley and in continuance of that a new clubhouse was built. The old house is now used as a lodging cabin for travelers. The catastrophic eruption in 1973 changed all plans regarding the new club house and the game of golf as volcanic ashes covered the whole course. Temporary course of xxxx holes replaced the 9 hole course until all ashes had been removed and that took full 4 years. In 1989 a new elegant club house was built as an addition in 1973 decision had been made to add another 9 holes but that came not to reality until 1994. The old course was left almost unchanged but the new layout was built on the seashore. The design is considered to be extraordinary in a magnificent surrounding where birds are in perfect harmony with the Atlantic ocean on one side and the rough shore on the other. Sometimes golfers just forget that they are playing for score in this land of contrast. 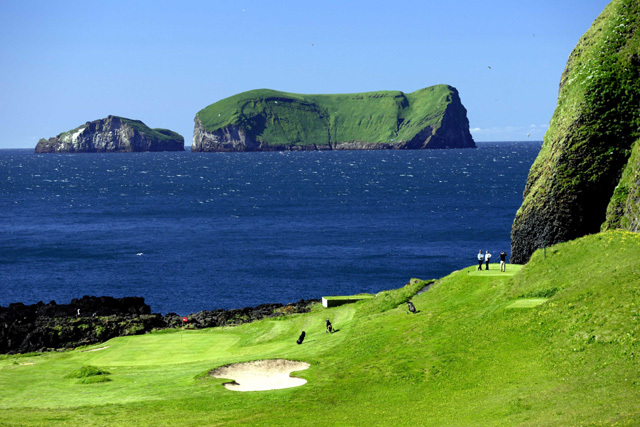 As Alister Nicol from GOLF MONTHLY wrote about the golf course “The Westman Islands course nestles in the crater of an extinct volcano and its scenery has to be seen to be believed. The course has many times hosted the Icelandic National Championship and again in 2008. The course hosted the Scandinavian championship for Amateurs in the year 2000. 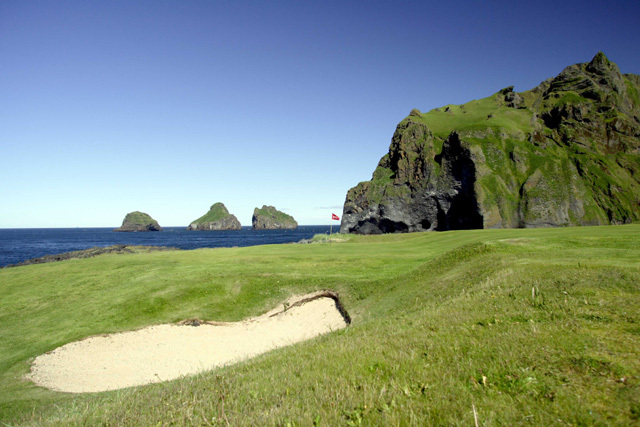 Golf Monthly ranks the course in Vestmannaeyjar as one of the best 200 courses in Europe. The course is demanding, especially the back 9 holes, but once you have tried you will certainly be back. 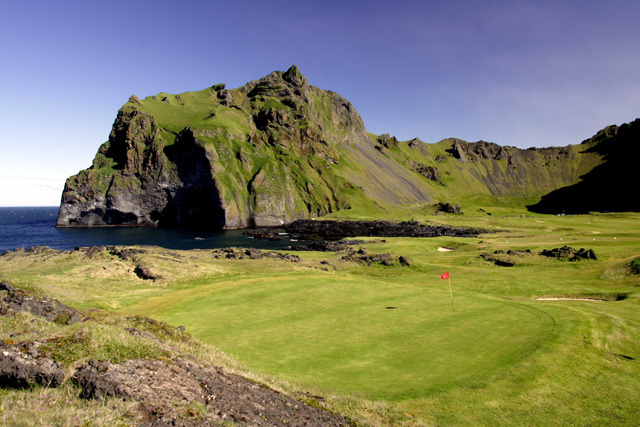 The mild climate in Vestmannaeyjar during the winter makes it even possible to play the whole year. The Volcano Open Golf Championship is a very interesting and enjoyable golf event in Iceland. It is an international event which attracts golfers from various parts of the world. The clubhouse is large and has first-class facilities, dining room and a TV lounge and a bar. The restaurant offers hot and cold meal. You can call at 354 – 481 2363. Maximum handicaps: 36 for gents and 36 for ladies. Midnight golf is open at request. Green fees include full use of the clubhouse facilities and restaurants. impression of the golf course and its surroundings. Click to watch videos from the golf course. The Vestmannaeyar golf course is located on one of the Vestman Islands which are group of islands of the south coast of Iceland. 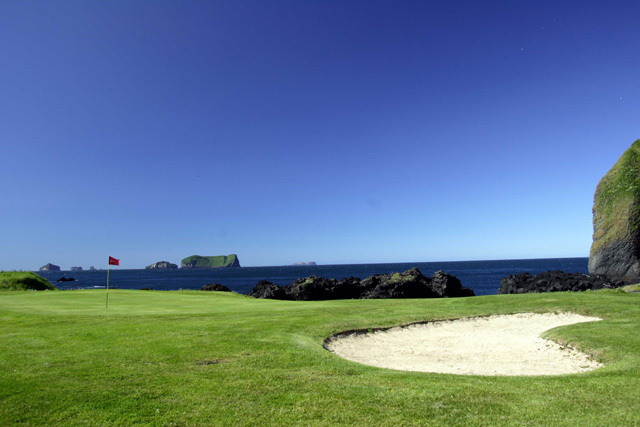 The golf course is located at the outskirt of the town Vestmannaeyjar on the island Hemaey. There are two possibilities to reach the islands. You can fly from Reykjavík airport, about 20 minutes flight or you drive yourself or take a bus to Landeyjahöfn where you board a ferry and the sailing takes about 30 minutes.